Posted on February 14, 2018 at 12:30 pm. 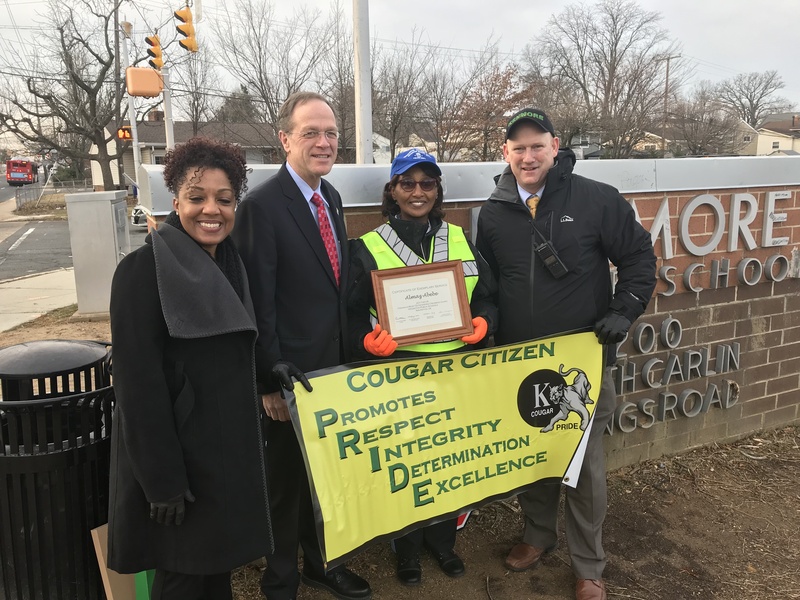 Kenmore Middle School crossing guard Almaz Abebe has been recognized by the Virginia Department of Transportation’s Safe Routes to School (VA SRTS) program as one of Virginia’s Most Outstanding Crossing Guards for 2017-18 school year. The recognition is part of Crossing Guard Appreciation Week, an annual Safe Routes to School celebration recognizing Crossing Guards for the critical role they play in the safe routes to school network. Nominated by a Kenmore family, Abebe is one of six crossing guards state-wide to receive the honor. VA SRTS received over 150 nominations for 76 different crossing guards throughout the Commonwealth this year. Abebe is the ever-vigilant crossing guard who is at her post on busy Carlin Springs Road before dawn and again at afternoon dismissal every school day, in all weather conditions. According to the nomination, Abebe treats students with “the kind of care and respect that is reflected in the respect students show her as they follow the rules and wait patiently to be crossed.” Known for her strength, awareness, and professionalism, she maintains firm control over the flow of buses, cars, construction vehicles, pedestrians, and occasional cyclists who travel through her intersection, remaining focused on ensuring the safety of students. “Crossing guards play a key role in keeping our most unpredictable travelers safe as they arrive and depart from school each day. The actions of Ms. Abebe on the first day of school highlight her ability to remain alert at all times and her readiness to act at a moment’s notice to ensure the safety of the students at her crossing. The safe environment she has created gives both students and parents’ peace of mind as they travel throughout the school year. 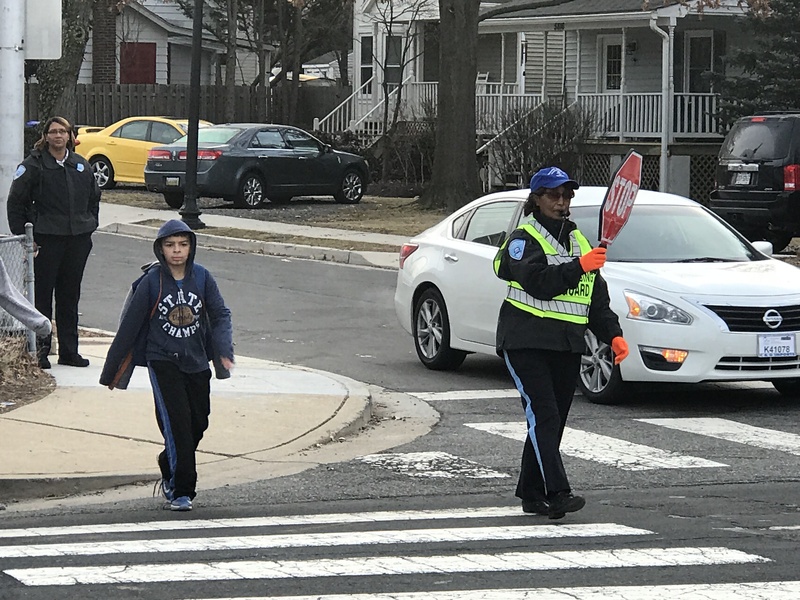 Arlington County is fortunate to have dedicated crossing guards, such as Ms. Abebe, who take pride in the job of safeguarding our students. We are honored that she is receiving this well-deserved recognition for her efforts,” said Arlington County Police Chief Jay Farr. Abebe has been with the crossing guard unit since February 2015. She has been stationed at 3rd Street and S. Carlin Springs Road since she started. She also has a second crossing at Patrick Henry Elementary School. 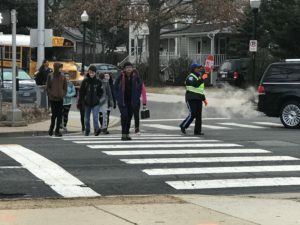 Crossing Guard Appreciation Week is a statewide event sponsored by the Virginia Safe Routes to School program each year to recognize and thank those who help students cross the street safely on their way to and from school every day. APS schools is celebrating Crossing Guard Appreciation Week 2018 through February 16.